← Bougainville Tourism News : Does tourism have the potential to sustain the economy of #Bougainville and assist the region achieve fiscal self-reliance. ” Bougainville Copper Limited (BCL) has serious concerns over proposed new mining laws that some members of the Autonomous Bougainville Government (ABG) seem keen to rush through parliament. The three bills that were introduced to parliament last Wednesday, with insufficient stakeholder consultation, are proving divisive at a time when unity is required in the lead-up to the referendum. The government of Bougainville in Papua New Guinea believes establishing its own company to re-open the long shut Panguna mine will solve its funding crisis going into the referendum. Bougainville is due to hold a referendum on independence from PNG in June this year. However, it claimed that the national government had not yet provided the money it is constitutionally bound to provide. The Bougainville government had previously placed a moratorium on re-opening Panguna to ensure the vote was not disrupted, but President John Momis said the region is facing an emergency. He said this is why it is setting up Bougainville Advance Mining in which the government and people of Bougainville will hold a permanent majority ownership. Landowners of the closed Panguna Copper and Gold Mine today called on the Autonomous Bougainville Government that they are ready to partner with the ABG and open the mine that created disunity amongst the people of Papua New Guinea and Bougainville. In an exclusive interview with New Dawn FM, Chairman of the SPECIAL MINING LEASE OSIKAIYANG LANDOWNERS ASSOCIATION (SMLOLA) PHILIP MIRIORI and LAWRENCE DAVEONA said that they are ready to talk with the Government on ways they can work together for Bougainville’s future. They said that they were not happy with the Government trying to make amendments to the untested Bougainville Mining Act. MIRIORI said that the Panguna landowners were tasked by the ABG to work on uniting the landowners and they had to do it just to find out that the Government had now changed their mind on the issues at Panguna. He said when the Panguna people are finally united they want to put issues of the past and work into the future. MIRIORI said that the Panguna situation is already complex with the landowners, RTG and BCL. If the ABG backs McGLINN the situation will become more complex. These bills mirror proposals put forward by an Australian opportunist Jeffery McGlinn, whose apparent primary business appears to be horse breeding. In presentations to MPs and others he has proposed a 40 per cent stake in Bougainville Advance Mining for his own newly formed company Caballus Mining with other unknown foreign investors and sovereign states. These developments raise very legitimate legal, constitutional and ethical questions, not only by BCL and its shareholders, but also by landowners in Bougainville and others in the community. More widely these bills could also be interpreted as both anti-competitive and anti-investment which is the last thing Bougainville needs. Bougainville introduced good laws and regulations in 2015 designed to rebalance Bougainville’s mineral rights after a long period of consultation with all stakeholders. Now those rights are being undermined in haste by these proposed changes. Any genuine investor worth its mettle should be able to work within the existing laws. The Bougainville Mining Act 2015 therefore does not need to be changed. 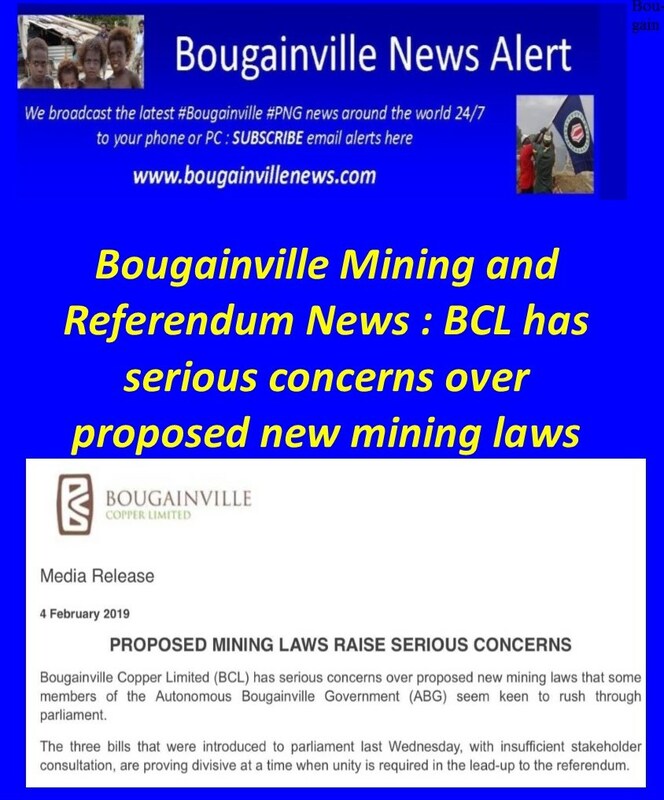 BCL urges ABG leaders to think very seriously about the unnecessary divisions being created by these proposed amendments to the Mining Act and instead re-focus on the important work of unifying landowners and Bougainvilleans at this critical time for Bougainville, as they prepare for the referendum. From the company’s own perspective, these legislative moves also ignore current court proceedings and BCL’s rights to natural justice and they are also at odds with the ABG’s decision to place a moratorium over the Panguna project area. The ABG has maintained there should be no discussions regarding mining activities in Panguna until after the referendum. In early 2018, the ABG advised of a decision not to grant BCL an extension of its exploration licence (EL1) over the Panguna project area. BCL maintains that the application process was both legally and procedurally flawed and was also undermined by other parties with competing commercial interests in Panguna mineral rights. To protect the interests of all those with a significant stake in our company, including the people of Bougainville, BCL commenced legal proceedings in the PNG National Court seeking a Judicial Review of the decision. We were subsequently granted leave by the court to seek the review. Since being invited back to Bougainville in 2012 by the ABG to reengage about the prospect of redeveloping Panguna, BCL has always conducted itself in an ethical and respectful manner and we continue to support worthwhile community projects. The ABG and PNG National Government remain major shareholders in the company and we retain strong support among customary landowners in the project area and others in the community. BCL also possesses valuable local knowledge, project IP and mining expertise. We have a highly-regarded local board led by respected Bougainvillean Sir Melchior Togolo as well as strong connections within the global mining and investment communities where there are potential project partners. For all these reasons BCL remains a viable option for future mineral development in Bougainville and in the best interests of all Bougainvilleans, we would urge all members of the ABG parliament to seriously consider this before the bills are further read on 12 February. Community leaders, landowners and others who are concerned by these proposals also have an opportunity to ensure their voices are heard by decision-makers before these laws are passed.